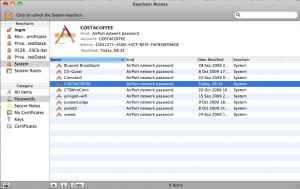 One of the neat features that I used frequently in MacOS X Leopard & Tiger was the ability to use the wifi connection tool to get the passwords for wifi networks that you have already connected to. Being a consultant I am constantly hopping networks and using different devices (Laptop, iPhone, etc. ), plus I also often get requests from family as to what their wifi passwords are. This handy password re-call feature was removed from MacOS X Snow Leopard. Once you entered a password in the wifi connection dialog box you couldn’t go back there to retrieve it. This is probably a security measure, as it didn’t require the user to enter a password to get at the wifi password. Well, I have just figured out how to get at them again. All the wifi passwords are stored in your Keychain. You can access the information using the Keychain Access application that is located in /Applications. You need to look in the System keychain, there you should find all the AirPort network passwords for all the wifi networks you have connected to. Just double click on the one you want to see and click the “Show password” checkbox. You will be prompted to enter your administrator password before being shown the wifi password in plain text. Following on from my presentation last night on TeamCity, I’ve been trying to configure our installation at work so that it can be accessed by our developers in the UK. The first problem is punching a hole in the firewall. This was done easily enough by our network admin, however it had to be done a different port than normal as the default port was already being used. Next, this port had to be configured in the Tomcat server.xml file. One of the clear things I discovered whilst changing the port setting is that it is possible to have both HTTP and HTTPS access to TeamCity at the same time on different ports. This meant we could keep the old internal HTTP port for local developers and set up the external port as HTTPS for our developers in the UK. Setting up HTTPS meant creating a certificate for Tomcat. It was easy enough to create a self signed certificate using the TeamCity documentation and the Tomcat documentation. The Tomcat documentation also includes information about importing a third party signed certificate. One thing to note about the self-signed certificate is that you can only import the certificate in Internet Explorer for future visits to the site if the value given to keytool for “What is your first and last name?” is the domain name used to access the site. This one had me confused for a while.